We do mention some other projects (aside from pfsense) that have used the existing DreamHost API to manage dynamic dns, so that much is possible: https://help.dreamhost.com/hc/en-us/articles/216944818-API-Apps#d_n_s — and we found the pfsense feature request that was completed to add DreamHost as an option, https://redmine.pfsense.org/issues/7321 — however, unfortunately, we are unable to find any instructions from pfsense on the actual setup, to understand what might be involved on our side. It sounds like, as you said, the new feature should eliminate doing it the old way with scripts (which would require the subdomain to be fully hosted). 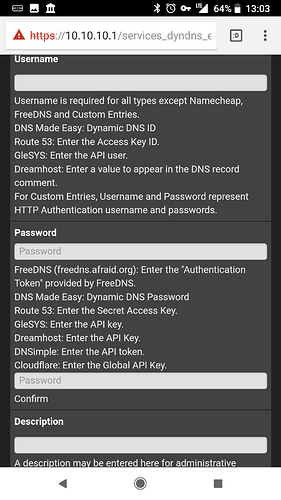 While we’re unable to officially provide support for the full setup from our end, if pfsense has any setup documentation available at all, we are glad to assist with the DNS settings in our web panel. It seems someone has done the work, so if no documentation exists, perhaps we can reach the developer/assignee on that pfsense feature! @DH_Mira Thanks so much for the response! and sorry for my delay in responding. haha yes, this is precisely my issue:). It isn’t listed on the, fairly well maintained, wiki page: https://doc.pfsense.org/index.php/Dynamic_DNS but it’s def an option in the user interface. It actually doesn’t have any special fields, so maybe there’s some info in one of the other entries that gives some clues? I came here looking for an answer to the same question, but I figured out how to do this. 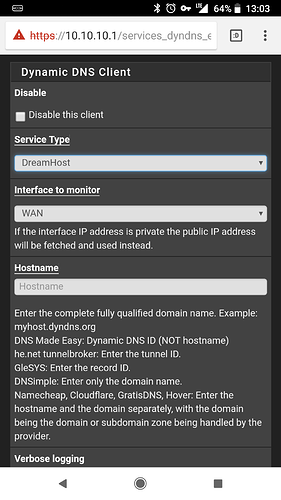 name: this is how you will access your home network / dynamic dns. For example, put ‘pfsense’ to access it at pfsense.example. org. The value field will get updated to your pfSense’s WAN IP address automatically once we’re done, but it needs something in there for now. You can leave the comment field blank. Enter ‘pfsense DDNS’ or whatever you’d like for the comment. 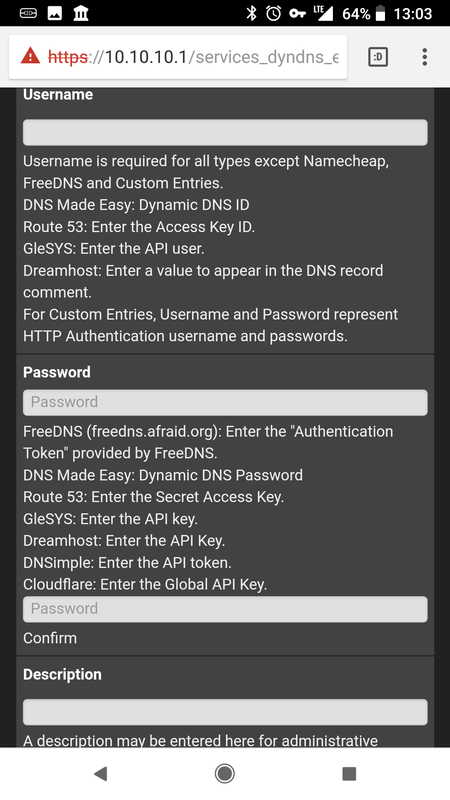 Give it access to “All DNS Functions”. Click Generate a New API Key Now! at the bottom of the page. Copy the API key it gives you. Hostname: the domain you created in step 1. For example, pfsense.example.org. Password: Your API key you generated in step 2. Click save, then go back into the record and hit “force update and save”. It should have your public IP address listed in the cached IP address field.